On Standing Rock Sioux Reservation in North Dakota, Native American Tribes are standing against development of a 1,172 mile oil pipeline. The Dakota Access Pipeline, or DAPL, is designed to cross hundreds of waterways including the Missouri and Mississippi rivers. Water protectors, as the protestors are called, are led by indigenous peoples and joined by non-native allies from around the country and world to call attention to DAPL, water security and the threat of potential contamination of our longest and largest national water basins. This spiritual and cultural moment is unprecedented in contemporary times with the largest gathering of Native American Tribes in over one hundred years. Water protectors stand unwavering under the banner of Mni Wiconi, Lakota words that express: Water is Life. 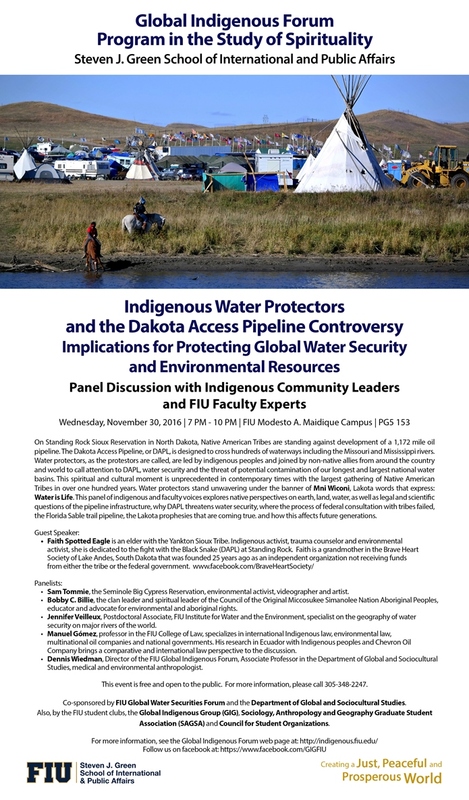 This panel of indigenous and faculty voices explores native perspectives on earth, land, water, as well as legal and scientific questions of the pipeline infrastructure, why DAPL threatens water security, where the process of federal consultation with tribes failed, the Florida Sable trail pipeline, the Lakota prophesies that are coming true. and how this affects future generations. Sam Tommie, the Seminole Big Cypress Reservation, environmental activist, videographer and artist. Bobby C. Billie, the clan leader and spiritual leader of the Council of the Original Miccosukee Simanolee Nation Aboriginal Peoples, educator and advocate for environmental and aboriginal rights. Jennifer Veilleux, Postdoctoral Associate, FIU Institute for Water and the Environment, specialist on the geography of water security on major rivers of the world. Manuel Gómez, professor in the FIU College of Law, specializes in international Indigenous law, environmental law, multinational oil companies and national governments. His research in Ecuador with Indigenous peoples and Chevron Oil Company brings a comparative and international law perspective to the discussion. Dennis Wiedman, Director of the FIU Global Indigenous Forum, Associate Professor in the Department of Global and Sociocultural Studies, medical and environmental anthropologist. This event is free and open to the public. For more information, please call 305-348-2247. Co-sponsored by FIU Global Water Securities Forum and the Department of Global and Sociocultural Studies. Also, by the FIU student clubs, the Global Indigenous Group (GIG), Sociology, Anthropology and Geography Graduate Student Association (SAGSA) and Council for Student Organizations.